Graduation episodes are tough, especially when no one's really going anywhere, but tonight managed to balance the simultaneous excitement and uncertainty of the future for our favorite seniors. Mercedes' YouTube video has landed her a recording contract as a back-up singer on an indie label. Mike Chang is off to Chicago. Santana's mother, played by Gloria Estefan, gives her blessing for Santana to forfeit her cheerleading scholarship and pursue a career in music in New York. Puck passes his geography test, thanks to a kiss from Quinn, and Brittany gets to repeat her senior year. Forever. Her grade-point average is a 0.0. Rachel, Finn and Kurt haven't heard from their schools yet and agree that when they get their letters, they'll all open them together. When those letters come, it's bad news for Finn and Kurt and good news for Rachel. Which is actually bad news for Rachel because now the three of them won't be together in New York. Here's a pet peeve about all of this college acceptance that's been going on this season. Quinn's is the only one whose timeline fits with when normal colleges send out their acceptance letters. Maybe performing arts schools are different, but these letters arrived after graduation. It bugs me that these kids are graduating and they don't actually have plans in place aside from "here's what I want to do." Maybe I'm just overthinking it. If this is my biggest complaint from the episode, we're doing okay, right? What else felt right about this episode? The flashbacks to the first season. 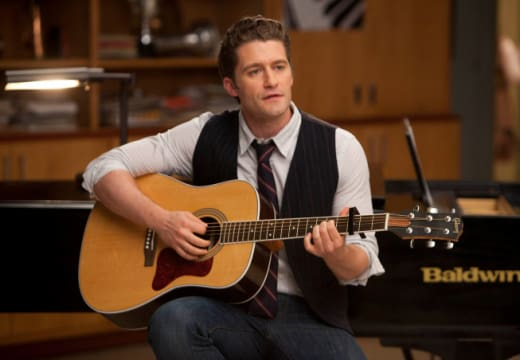 The original members singing "Sit Down You're Rocking the Boat" was nice, but what was really great was Burt Hummel's graduation present to Kurt. Seeing him dance to "All The Single Ladies" and seeing scenes from Kurt's original trip down Beyonce' lane was funny, and it was perfect for this father-son duo. There's something about their pairing that has always worked well in the midst of story lines that seemed very broken. The thing that felt both right and wrong was that whopper of a scene at the end. Finn broke up with Rachel so she could pursue her dream. We knew it would happen. That it would have to happen. There was no way the two of them would get married. But still, in that moment, I felt the heartbreak of teenage love all over again. When Rachel put it all together and figured out what was happening, I felt it with her. I sat here biting my nail nervously and hoping the tears welling up in my eyes didn't spill down my cheeks. I like these two together, for whatever reason, but I know that young love isn't always endless love, and so, this was necessary. That scene coupled with the shots of her walking through the city, while it was a bit indulgent of Rachel Berry's character when this is an ensemble cast, felt strangely adult. It felt like a new beginning, which is hopefully what we'll have when the show returns this fall. Give the finale a grade in our poll and then tell us what you thought of tonight's episode.